Over 730,300 people fleeing violence in Myanmar have sought refuge in neighbouring Bangladesh since the outbreak of violence in August 2017. Families were forced to abandon their homes and leave everything behind to escape the violence. Houses were on fire, people were screaming, many had to leave with no spare clothing or possessions. Most Rohingya people are living in overcrowded makeshift camps where they are in desperate need of food, clean water, and shelter. Now, as monsoon and cyclone season hits, heavy rains bring the danger of mudslides and an increased risk of waterborne diseases. Women and girls initially bore the brunt of the crisis, with sexual violence being widespread. 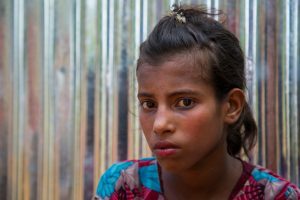 The threat of violence loom over Rohingya children like Taslima (pictured right). Their futures are at risk. Taslima, 10, saw her father being shot dead in the violence in Myanmar. She walked barefoot for five days to get to Bangladesh. Although a refugee camp sounds safe, it often isn’t for girls and women. The risk of them being exposed to violence, sexual assault and trafficking increases significantly. Since August 2017, we’ve been on the ground in Bangladesh delivering a lifesaving humanitarian response. We take a women-led, women-centred approach which includes providing food, water and sanitation, and dignity kits. Crucially, we have built Women’s Safe Spaces for women and girls to receive hygiene kits, emotional support, access medical referrals, and where mothers can breastfeed in private. By donating today, you can support women and girls like Taslima access to these vital Women’s Safe Spaces. Spaces that are free from the fear of sexual violence and where they can get the support they so desperately need. Please give what you can. €50 could help create Women’s Safe Spaces.